If you're looking for a chatty bird, a Quaker parrot can fill the bill. 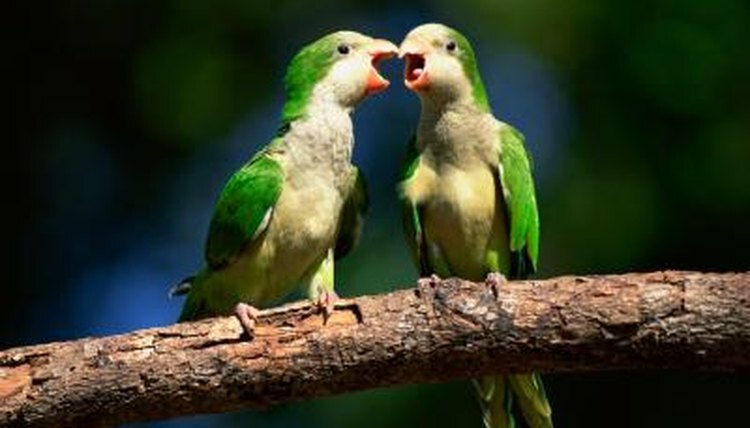 Also known as the monk parakeet, this medium-size bird can live as long as 25 years, so owning one is a major commitment. Although a Quaker parrot picks up words easily, he doesn't necessarily pick up good manners. For best results, purchase a hand-raised Quaker parrot raised by someone experienced with birds. Otherwise, you could end up with a biting, aggressive pet. Before bringing home a Quaker parrot, make sure it's legal to own this bird in your state, as many states do not allow them. That's because if Quaker parrots get loose and become feral, they're considered an invasive species, crowding out native birds. If Quaker parrots aren't permitted in your state, an avian vet can't treat your pet and legally should report you to the appropriate authorities. As of 2013, it is illegal to keep a Quaker parrot in California, Hawaii, Pennsylvania, Colorado, Tennessee and Kentucky, according to BirdChannel.com. Other states impose restrictions, including obtaining a permit from the Department of Fish and Wildlife or similar state agency to own the bird. Provide your Quaker parrot with the largest cage possible. Make sure the bars don't contain zinc coating, as that metal is toxic to birds. Give your pet lots of toys to play with, along with perches made from tree branches. Because of his territorial nature, create an additional play area for your Quaker parrot outside of his cage. If he never leaves his cage, your parrot can become aggressive about defending it, attacking you when you clean it or change food and water. Quaker parrots are hardy -- another reason they're illegal in certain places. They can survive cold temperatures that kill off other parrots. That doesn't mean you can keep your parrot in a very cold or very hot area, but they are less sensitive than other birds. VCA Animal Hospitals recommends a pelleted diet developed for parrots as the best primary food for your bird. It advises that pellets should make up between 75 percent to 80 percent of a Quaker parrot's diet. The remainder of the daily diet should consist of fruits and vegetables. Wash fruits and veggies and cut them into small pieces before feeding. Put them in a bowl separate from your parrot's pellets. Remove any uneaten fruits and veggies within 24 hours. Your bird always needs access to fresh, clean water. If you don't feed an all-seed diet, commonly fed to parakeets, you probably don't have to worry about your Quaker parrot coming down with fatty liver disease. However, if you acquire a parrot previously fed seeds, you'll have to wean him over to the pelleted diet. This process can take a while, but don't give up. A Quaker parrot needs attention and stimulation. If he doesn't receive it, vices such as feather plucking can ensue. Spending sufficient time with your smart little bird every day, teaching him words and allowing him supervised playtime outside of his cage, usually prevents this self-mutilation.